Are You a Good Business Planning Coach? 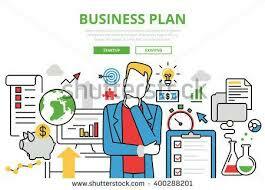 It’s time to do your business plan! So, my blogs through December and early January will focus on helping you create that business plan–and getting your agents to plan. listings taken to listings sold in normal market time. Your success rate with listings sold is, in my opinion, the one most important reflection of agent value propositions out there. For example: A�George Smith, a 10-year seasoned agent, has demonstrated a consistent listing strategy. A�Georgea��s a�?success ratioa�� is 40%. That is, he sells 40% of his listings in normal market time. What does that say about Georgea��s values proposition strategy? How is George a�?usinga�� his listings? Is that the culture you want perpetuated in your office? Sally Overton has a different value proposition strategy. She has a 90% success ratio in listings taken to listings sold in normal market time. Obviously, she is building her referral systema��her raving fans. She is making herself more money in less time. She is drastically reducing the number of complaints (and attacks on her self-esteem, too). She is a role model for best practices in her real estate office. Is that practice more in line with your culture? Your opportunity: As Georgea��s business planning consultant, youa��ll be a�?testinga�� George to see if he wants tochange his strategy (some agents love being a�?bait and switchersa�� too much to change). Youa��ll have the opportunity to help Sally leverage her awesome conversion rates to obtain even more raving fans. (Nothing succeeds like success). Do you know your ‘conversion numbers’ in listings taken to listings sold for your company? When you make your own plan, be sure to do a thorough review, and find this number. A high number means you’ll be able to recruit better, get better retention, have better team spirit, and your agents can build on that reputation. A low number means you have a lot to work on! Click here for a list of common agent business planning mistakes to help you as you coach agents through the planning process. Excerpted from my online agent business planning system, Beyond the Basics of Business Planning. Managers: Frustrated because you can’t get your agents to plan? Problem solved! I’ve put my exclusive planning pages online–plus webinars to help you get through that plan fast. Don’t wait another year for business success. See more here. 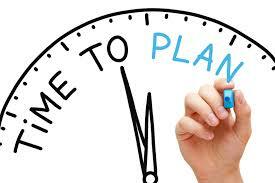 It’s time to do your business plan! So, my blogs for December and early January focus on helping you create that business plan–and getting your agents to plan. So often, our business plans are ‘big picture’. It’s lovely, it’s inspirational–and it’s utterly not useful to our everyday practice! For a business plan to work, it has to have the ‘big picture’ parts (vision, review, mission, objectives) AND the action plan parts–those things you really intend to do each day and week. These are the actions that result in reaching your monthly and yearly goals. 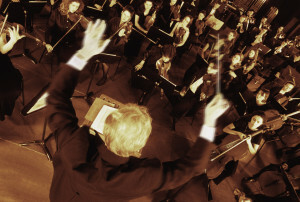 What Action Plans do Leaders Need? Here’s a graphic from my online resource, Beyond the Basics of Business Planning. You can see the specific action areas I think you need in your business plan. 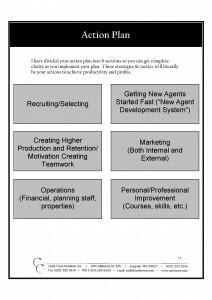 I made these divisions so that you actually could create action plans that had relevance to what you do every day. And, accomplishing actions in these areas assures you are taking daily steps to reach your goals. Too often, when we get to the weekly and daily tasks, the actions that effect our bottom line just don’t happen. For example: You’ll see that recruiting plans are one area of our action plans. But, life gets in the way and we just don’t recruit. So, to assure you do the actions you KNOW will result in greater productivity and profits, use these divisions and make your specific plans. In my business planning systems, I’ve made detailed, fill-in forms that assure you think through and make action plans for each of these areas–action plans you can rely on. Otherwise, my experience shows that brokers just don’t get to the details of action planning. Click here to get a copy of these action plan areas. Leta��s get real. Your agentsA�arena��t motivated to build that business plan–and we aren’t either. We know wea��re supposed to write business plans. Yet, if your agents areA�like 95% of real estate professionals, doing that seems just like an exercise in futility. Most business plans don’t inspire. There are components left out of most plansa��components that put the inspiration and motivation into your plan and your agents’ plans. I’ll give you specific guidance for you to put that magic into businessA�plans, so you and your agents are inspired every daya��not only to complete the plan, but to use it as a very personalized and specific guide to your success. Unfortunately, when most people write business plans, all they do is fill in some blanks with a�?guess numbersa��. The problem here is that numbers in blanks arena��t inspiring. They arena��t motivating. They dona��t call out and suggest to you that you should look at those numbers once in awhile! And thata��s as individual as we are. Martin Luther King didna��t say, a�?I have a business plan.a�? He said, a�?I have a dreama�?. 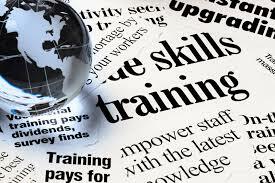 You must include the a�?dreama�� part of your future in your business plans to make that plan useful to you. That means, you as a business consultant, need to include the three ‘missing’ parts of business plans that I describe below. Thata��s the motivator. In other words, we have to have a big a�?whya��. Most business plans dona��t build in the a�?whya��. Thata��s why they fall flat, and leave us cold. Thata��s why agents dona��t want to go through the exercise of creating them. Managers always commiserate that they cana��t get their agents to write business plans. You wouldna��t want to write a plan, either, if you know it wouldna��t help you with your business the next year. Thought you’d get it done but it’s still on your ‘to do’ list? I want to help! 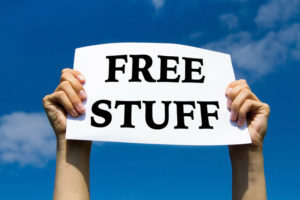 So, I’ve adding a discount on my online business planning resources through Dec.31 . Special discounts through Dec. 31 Purchase the agent’s planning resource, Beyond the Basics of Business Planning for agents, and save $20 (regularly $99). Use coupon code agent bus plan. Business Planning: Have You Left Out your Mission? Whata��s your mission? Ita��s time to begin writing your business plan for 2019. 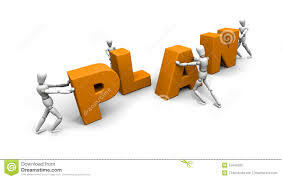 In the next few blogs, I want to give you a few tips on creating various parts of your business plan. One of the important, but often-left-out parts of a business plan is your mission statement. What it is? Ita��s literally your mission in your business. How are you going to achieve your mission? To keep yourself on track. To decide what you will and wona��t do. To state who you work with (and to think about who you wouldna��t work with). Mission statements are not quantifiable. Leave out any numbers a�� they go into your objectives. 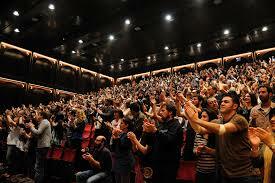 Following is an example: A person may write, a�?I am a profitable agent. I will make a profit of $50,000 every year.a�? The first part of the statement, a�?I am a profitable agenta�? has a place in a mission statement. But the last part of the statement is an objective, or quantifiable end result, and should be placed in another section of your plan. The mission statement is broader; it guides you as you make long-term decisions. The above offers some valuable tips on writing mission statements. Because mission statements are really statements of you as a businessperson, these statements are not lightly changed a�� just as you would not lightly change yourself. That does not mean that you might not work over time on how your statement is constructed, but it does mean that you do not change the essence of the statement, the specialties, the ideals a�� without considerable thought. Statements should be written in the present tense. These statements convey you at your best a�� how you see yourself as a real estate professional. Because you may not have actually attained the picture you have in mind, you may be writing about yourself as you see yourself in the future. To cement that thought in your mind, use present tense verbs as you create your statement. Mission statements first clarify for you whata��s important, your focus, and your limitations. Then, they help consumers choose you. Use the parameters above to create your mission statement. What do you want to bet that 95% of real estate agents wona��t have a business plan for 2019. But, wouldna��t it be awesome of could reverse that percentage? Here are some steps that will work for you. I know, because I got 95% of the agents in my real estate offices not only to create plans, but to actually look at them throughout the year. Herea��s how. Ita��s estimated we are told a�?noa�� 148,000 times prior to age eighteen. No wonder we dona��t want to commit to try anything! I know from teaching adults to play the piano, that adults are conditioned not to try anything new for fear of not being perfect. To many, writing a business plan means planning to faila��and then getting punished for it. So, the first time you introduce business planning, take away the old downside of goal setting and help your agents move in incremental steps forwarda��a step at a time, with lots of positive reinforcement along the way. You have to create a safe haven for first-time planners. One of the agents in an office where I just did a small group coaching series told me he put a picture of an elephant on the wall, and then literally divided the elephant into bite-sized pieces, with an action step listed on each bite. What a wonderful visual! For many of your agents, planning is just the most overwhelming process they could envision. So, simply start with one or two areas. Personally, I start with 2-3 areas in the Review. For example: George Smith, a 10-year seasoned agent, has demonstrated a consistent listing strategy. Georgea��s a�?success ratioa�� is 40%. That is, he sells 40% of his listings in normal market time. What does that say about Georgea��s values proposition strategy? How is George a�?usinga�� his listings? Sally Overton has a different value proposition strategy. She has a 90% success ratio in listings taken to listings sold in normal market time. Obviously, she is building her referral systema��her raving fans. She is making herself more money in less time. She is drastically reducing the number of complaints (and attacks on her self-esteem, too). She is a role model for best practices in her real estate office. Your opportunity: As Georgea��s business planning consultant, youa��ll be a�?testinga�� George to see if he wants to change his strategy (some agents love being a�?bait and switchersa�� too much to change). Youa��ll have the opportunity to help Sally leverage her awesome conversion rates to obtain even more raving fans. (Nothing succeeds like success). 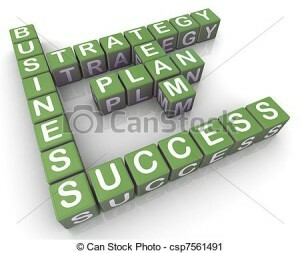 Have a great business planning process to provide your agents. (Never just ask them to make a business plan, because youa��ll get all kinds of formats). Dona��t overwhelm your agents with too many planning pages to start. Customize your package with each agent. If you can get each agent to look at 1-3 areas of his business, and plan change strategies for a better year in that area, youa��ll have started the processa��a process that will continue, grow, and reap big benefits by year three.